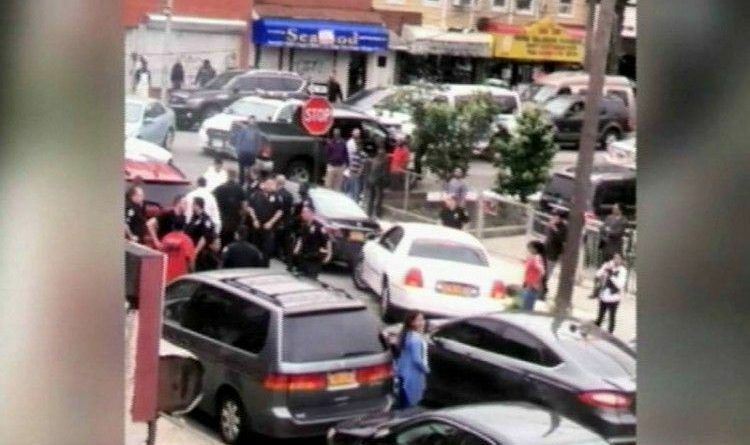 More than 30 angry Queens residents banded together to try to stop federal immigration agents from arresting an undocumented man accused of burglary. A woman kneeled in front of federal immigration agents as they walked her brother — accused of burglary and illegally reentering the country — to an unmarked car in Queens, New York. The incident occurred when ICE agents, who swooped in while driving unmarked cars, boxed in Sampat on the one-way street as the driver of the car in which he was riding tried to get away. Dozens of residents were shouting and trying desperately to keep the feds from arresting Hardat Sampat, who is from Guyana, New York Daily News reported. Sampat will remain in custody until at least June 15th, and then officials will determine whether to release or deport him. “He had previously been released from the custody of the New York Department of Correction with an active detainer in place,” ICE spokeswoman Rachael Yong Yow said in a statement. Video taken at the tense scene showed neighbors standing in the one-way street blocking a caravan of federal vehicles. “You don’t know what kind of heartbreak it is to see this,” one woman said about Sampat’s arrest. “I understand,” an ICE agent replied. “No you don’t; you say you understand,” another woman said. Sampat willingly agreed to be deported back to Guyana while he was in prison in Florida on assault charges about five years ago but came back to the U.S. illegally to be with his relatives. Police arrested Sampat weeks ago for burglarizing the Rockaways home of a 37-year-old woman he knew on April 9 and on April 30. During the second alleged break-in, he vandalized the apartment by spraying white paint on the walls and furniture, according to court papers. And he wonders why he’s on his way out of the country? Liberals don’t care they are damaging this country when they refuse to enforce the law and stop allowing immigrants into this country. They are selling out our country for their own personal gain! Unlimited Illegal immigrants are wanted for two reasons, the Democratic vote, and money involved. Leftist and elitist sheriffs who offer sanctuary are a sign to the rest of the world that we don’t care one bit about our own laws. Sadly, money is all they’re after. They don’t care about the people or even the immigrants until they need votes. That is why we voted for President Trump. Trump cares about them. When he says he’s going to do something, he does it! He is keeping his promise that is for sure! Michelle is American conservative author she is committed to the constitutional principles of individual freedom, economic liberty, limited government, personal responsibility, and traditional values. She is a libertarian and provocateur who believes in freedom and liberty for all Americans. As a passionate journalist, she works relentlessly to uncover the corruption happening in Washington, while exposing politicians and individuals who wish to do us harm. She writes for Conservative US, Right Journalism and Supreme Insider!